For me, it's difficult enough to come up with easy snack ideas for my family that aren't filled with artificial flavors and/or high fructose corn syrup. Add a busy day of running errands and the task of grabbing snacks for our "go bag" is even more of a challenge. While I while try to avoid the lollipops and fruit snacks that I know Grace would prefer, I'd still like to offer her something a bit more substantial than the usual crackers or pretzel that I throw into our bag. Something that resembles an actual food group! 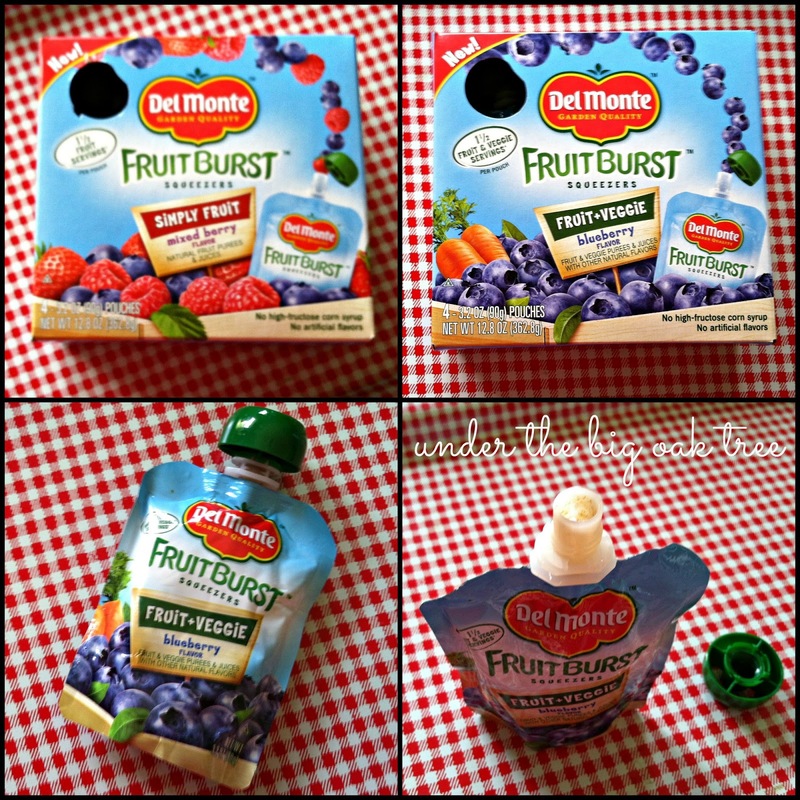 Del Monte has made it easy to offer your family just that with Del Monte Fruit Burst Squeezers! Since you drink/squeeze them right from the tube, there's no need for a bowl or spoon! Making them super-easy and perfect for in the car, packing in school lunches, or when you just can't get your kiddo to come inside from playing outside! Plus, these aren't just for kids! They are great for us busy parents, too! Throw a couple in dad's lunch box before he leaves for work or even keep one in your purse for when you need a quick snack while waiting in the school pick-up line! For more information about Del Monte Fruit Burst™ Squeezers and other great Del Monte products, check out their website! You can also find them on Facebook, Twitter and Pinterest! Del Monte was generous to send me the gift package shown above. In addition to the two boxes of the Fruit Burst Squeezers in order for me to provide this review, the gift package also included a lunch box (or "go bag" as Grace calls it), 2 eco-friendly shopping totes that fold down to tiny fruit shapes, and a magnetic photo frame. 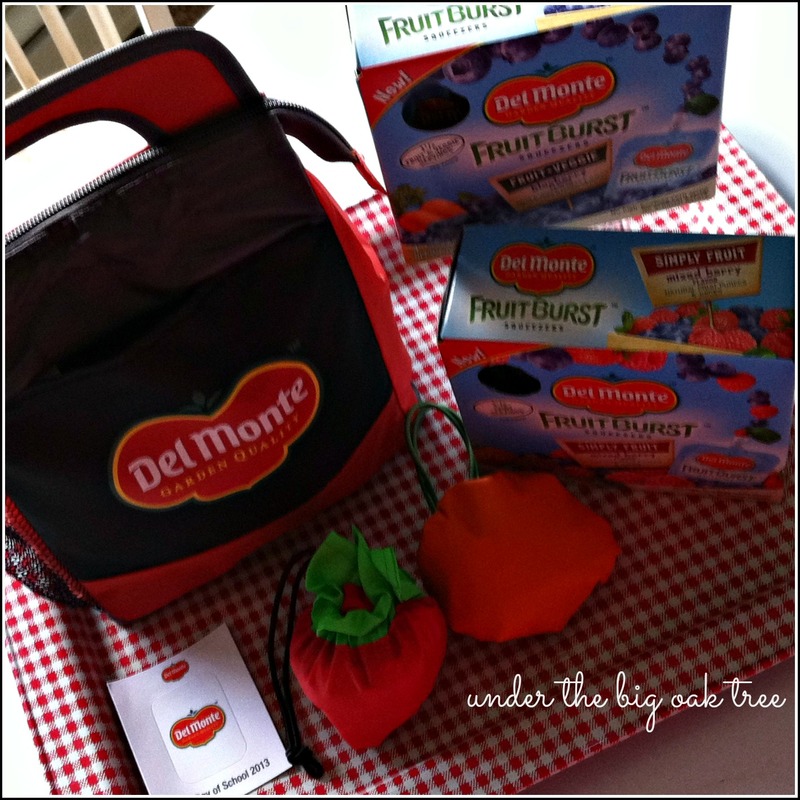 Do you want to win a Del Monte® Fruit Burst™ Squeezers gift pack just like the one I received? Del Monte was very generous and has provided not only a gift pack for me to review, but also one for me to share with one lucky Under the Big Oak Tree reader! Disclaimer: Although I received products mentioned in this review as well as an additional prize package for one lucky reader, all opinions of the product are honest and my own. I was not compensated in any other way for this review/giveaway. I like the Del Monte Fruit Cup Snacks Mandarin Orange. Oh I would also love to try the Fruit Chillers® Frozen Treats! I saw the diced Mango and am now in a hunt for them in the store. I can't explain my love of mangos but they are so good.